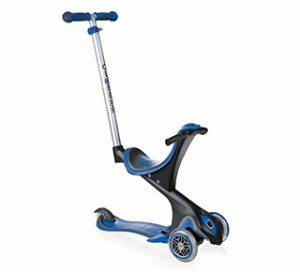 All models come with an adjustable T-bar, reinforced structure to support up to 50kg in scooter mode, and high-quality PU casted wheels. You can upgrade any model to our EVO LIGHTS series for battery-free LED front wheels which flash in red, green & blue. So, what are the main differences between EVO 4in1, EVO 4in1 PLUS and EVO COMFORT? EVO COMFORT comes with its own seat support bar, so it’s the only EVO model which allows you to not only move the seat up, but also backwards, so your child has even more space for his or her little legs! EVO COMFORT comes with a 4-height adjustable T-bar while EVO 4in1 & EVO 4in1 PLUS are 3-height adjustable scooters. EVO COMFORT has the widest seat at 14cm wide*, while EVO 4in1 & EVO 4in1 PLUS curved seat is 9cm wide*. EVO COMFORT & EVO 4in1 PLUS come with a removable footrest to place your child’s feet in pushchair mode. EVO 4in1 PLUS & EVO 4in1 offer a distinct screw-less design to change from pushchair to walking bike to scooter with just a click of a button! *Width measurement taken from the middle of the seat, edge-to-edge.